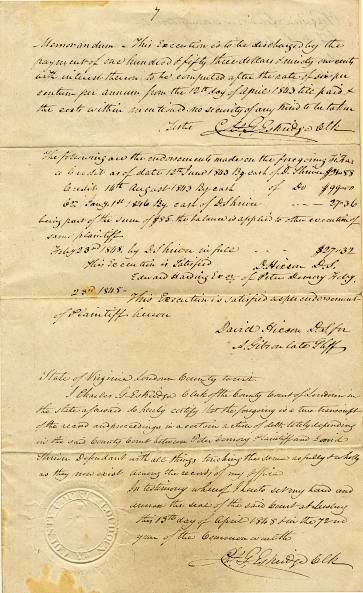 Legal Document from the Commonwealth of Virginia dated in 1843. This item has the signatures of Charles Eskridge (Clerk), David Hixson, F. W. Luckett(Presiding Justice), and is over 164 years old. 10 written pages. 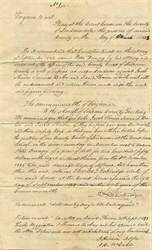 Loudoun was formed in 1757 from Fairfax. It lies on the eastern slope of the Blue Ridge Mountains, which divide it from Clarke County, Va., and Jefferson county, West Va., Its other border counties are Fauquer and Prince William on the South, and its mother county on the east. The Potomac river waters and skirts its entire northern border, and the Washington, Ohio and Western railroad traverses its central portion from east to west, brining it into easy communication with other section and furnishing means of transportation for the very great quantity of gran and the large number of fine cattle raised in it. There are twenty-five counites in the State having a large area than Loudoun, but its real estate value is larger than any-- aggregating more than nine millions of dollars. The lands are immensely rich and productive. Loudoun takes first rank in the production of Indian corn, averaging one and a quarter million bushels annually. She also stands first in the butter made (500,000 pounds), wool clipped (200,000 pounds) and numbers of milch cows, which exceed 7,000 of finest breeds. In the amount of wheat grown, she is third, with half a million bushels annually to her credit. In number of horses and grass raised she is also third, and in the value of her orchard product fourth. Leesburg, the county seat, is a thriving town of 2,000 population, names after the Lee family, who were its earliest settlers.